"The designs in this book began as art glass windows in houses designed by Frank Lloyd Wright. 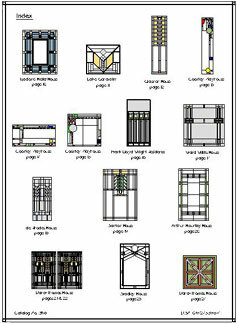 In addition to fifteen cross-stitching charts there is a brief detailed description of the window construction that includes a full scale drawing that illustrates the complexity of one of these windows. My hope is to give you an awareness for the way the glass and came was combined in the design so that you can better understand and enjoy your cross-stitching of prairie style designs." 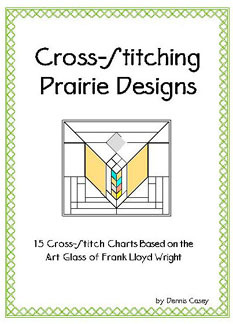 This book contains 15 Cross-Stitch Charts based on the art glass of Frank Lloyd Wright. All Cross-Stitching Charts contain a DMC color key, a stitch count diagram with fabric and design size information. Also available is a package of 7 Cross-Stitching Charts not included with this book.